The backside of Uptown'sMuddy Waters coffee shop has a gorgeous, ground-to-roof mosaic adhered to it. 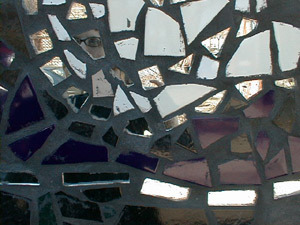 It's comprised of mirrored and colored bits that form stars, moons and other shapes. It's very sparkly and neat. This close-up doesn't do it justice.